THE Northern Ireland Ombudsman Tom Frawley has called for an official apology for a school employee who was warned that by giving a pupil a biscuit she could be seen to be “grooming” the child, writes Gerry Moriarty . He said the woman was due a written apology and a consolatory payment from the Western Education and Library Board. In January 2008 the woman, a catering supervisor at St Mary’s primary school in Brookeborough, Co Fermanagh, was asked for a biscuit by a child. She agreed and asked a colleague to hand the biscuit to the pupil. The following day the woman, who is related to the child, was told by a senior teacher that under the Child Protection Act she could be seen to be “grooming” the child. The woman left the school because she felt she was being “grilled”. This week the Impartial Reporter reported a priest was told she was absent due to a “serious child protection issue”. 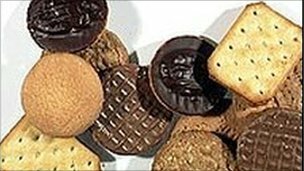 A school dinner lady was told giving a child a biscuit could be considered grooming, her husband has claimed. Kathleen Lavery left her job at a primary school in Brookeborough near Enniskillen, Northern Ireland after she was disciplined over the incident. Her husband Owen said she was forced to endure gossip and rumours and lived with a shadow hanging over her. Mrs Lavery, who was catering supervisor at St Mary’s Primary School, was subjected to a disciplinary procedure after telling a colleague to give a youngster, to whom she was related, a biscuit. The married mother, who had worked at the school for many years, alleges she was told her actions could be interpreted by some as grooming a child for sexual purposes. She was forced to attend three management meetings about the incident but eventually quit her position under what her husband has claimed was “horrendous” stress. Mrs Lavery complained about her treatment and the Ombudsman of Northern Ireland has now produced a report condemning the way in which the local education board dealt with the issue. Owen Lavery her husband told the BBC that his wife had suffered a “horrendous two-years”. He said that his while his wife had not actually been accused of grooming, she had been told that her actions could be considered by some as such and therefore needed investigating. The issue, which occurred in 2008 but has only just come to light, now been resolved and Mrs Lavery has since returned to work at the school. But the chair of the Stormont Education committee, Mervyn Storey, said it was a case of "political correctness gone too far". "I think it's a sad situation that schools are so boxed in because of legislation," he said. A statement issued on behalf of St Mary’s school by the Council for Catholic Maintained Schools said: “We understood that the issues were resolved to the satisfaction of the individuals involved using mediation through the Labour Relations Agency. A spokesman for the local education board said: “The Board has noted the findings of the Ombudsman’s Report issued in September 2010 and is presently actioning the recommendations. “Neither the Board nor any of its employees were, at any time, party to any accusations of grooming against the Unit Catering Supervisor referred to in recent press reports. The chair of the Stormont Education committee Mervyn Storey has described a case where a school catering supervisor was told she could be seen to be 'grooming' a child after giving him a biscuit as "political correctness gone too far". It happened at a County Fermanagh primary school in 2008. He said children must be protected but common sense must also be used. The incident was reported to the Ombudsman. Mr Storey said rules were there to protect children and staff. "The difference is that in these cases common sense is not common - we have a society which is very politically correct," he said. "I think it's a sad situation that schools are "so boxed in because of legislation." It's understood a complaint was made to the Ombudsman Tom Frawley after the incident. It's also reported that he recommended that the Western Education and Library Board (WELB) should make an apology to the woman and make a consolatory payment. A spokesperson for the Western Education and Library Board said: "The board has noted the findings of the Ombudsman's report issued in September 2010 and is presently actioning the recommendations."